NIPPING-the process of reducing / knocking out the Swell in the spine of: Thread-sewn Book-Block or gathered/collated folded-forms (signatures) being pressed for Hard-case or Soft Cover / Perfect Binding. SMASHING-the process of removing the air from the folds and flattening the overall area of the Book-Blocks. BOOK-BLOCK should be rectangular in shape and free from extreme gradients in the folded sewn area for quality and enhanced life of-the BOOK. Nipping Press and Smashing & Nipping Press, these offline semi-automatic machines for producing rectangular & compact Book-Blocks have become an important part of the Binding industry. To meet the need for faster system with maximum safety and operator efficiency, the ONLINE System was launched. The unit consists of two independent pressing stations for Nipping and Smashing respectively to process sectionsewn book blocks. 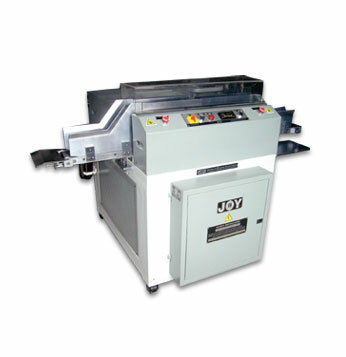 The machine can be used as an offline or in conjunction with another Book-block preparing system. Book-block is dropped manually at the feeding station on the conveyor. A simple mechanism ensures the same travels the correct distance to position itself in the centre of the Nipping and Smashing stations respectively. Conveyor enables the Book-block to be delivered to the Chute whilst Nipping & Smashing of the subsequent blocks are being processed at 15/20 cycles per minute. PLC based control panel ensures optimum reliability and simple diagnostics with sensors ensuring no damage is caused to any Book-Block. Centerlised Lubrication System incorporated to ensure maximum life of the phosphor bronze bush/s and smooth functioning. Power saving feature ensures the motor switches off automatically after pre-set delay time. Ambient temperature in the Power- Pack area is maintained for consistent productivity and extended life of rubber parts.